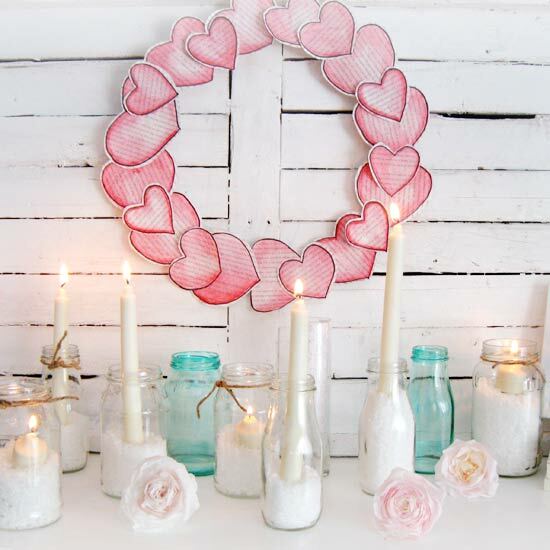 Get ready for Valentine's Day with these cute mantel and/or shelf displays. There is always at least 1 area of your home that can use a holiday pick me up, right?!?! 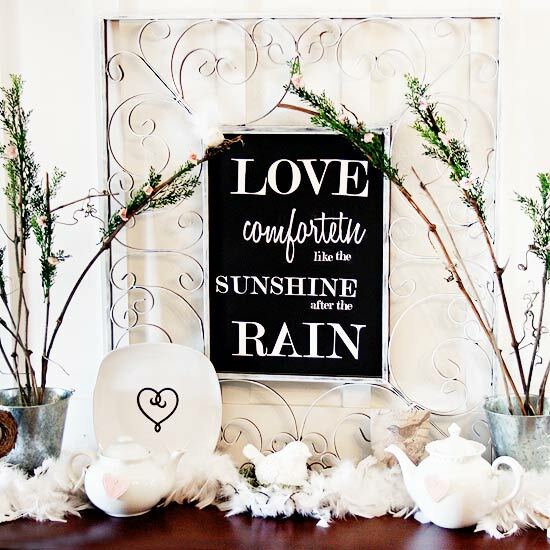 thestoriesofa2z.com decorated her Valentine's Day mantel with her love of tea in mind. She created the heart tags and the heart on the white plate using a die-cutting tool; she painted the tags by hand to give them texture. She cut the Shakespearean quote ("Love comforteth like the sunshine after the rain") using her die-cutting tool and glued the letters to black cardstock. She taped the finished piece to a mirror with a wrought-iron frame. The flowering branches were made by attaching faux greenery to sticks using crafting wire and adding pink tissue-paper blossoms. When decorating her mantel for Valentine's Day, craftberrybush.blogspot.com wanted to recreate the romance of a French cottage. 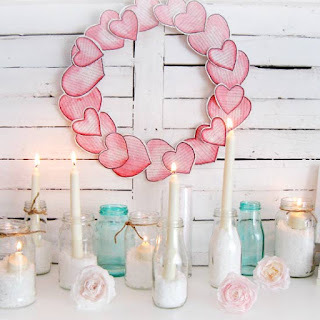 She made the heart wreath by gluing painted hearts cut from dictionary pages onto a cardboard wreath. The roses on the mantel were made from dyed coffee filters wrapped around florist's wire. For a romantic touch, she made candles a main feature of her mantel, displaying tall cream-color candles in recycled glass jars filled with faux snow. 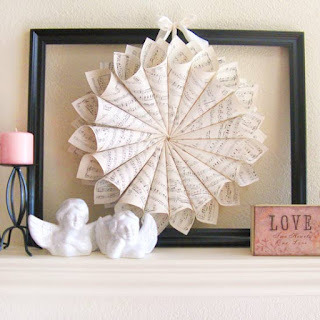 A crafty wreath made from sheet music hung in a black frame accents this simple Valentine's Day mantel. To make the wreath, adiamondinthestuff.blogspot.com split a foam wreath form in half, covered it in cream-color satin ribbon, and hot-glued two layers of sheet music cones to it in a circle. She wanted to keep her mantel decorations simple, so she pulled most of these items from around her house. White ceramic angels, a wrought-iron candleholder, and a small box with a quote ("Love: Two Hearts, One Love") finish the display in style. Memorialize a romantic location -- like where you met your significant other or the spot of your first kiss -- with this Valentine's Day DIY. Apply rubber cement to both the map and a foam-core board, then press the pieces together. Let dry. Trim away any excess map with a crafts knife and ruler. Print out the LOVE template. Using tracing paper, trace the word in reverse onto watercolor paper. Cut out the letters. Line up watercolor paper and board edges and glue the watercolor paper over the map. Trim any excess on edges with a crafts knife and ruler. A standard bulletin board gets a Valentine's Day makeover with decoupage and glitter. 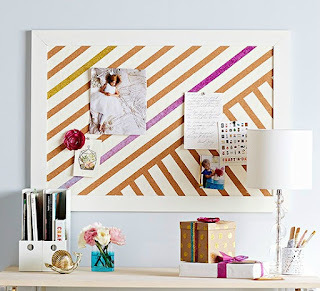 Use painters tape and a ruler to mark straight lines, then paint the exposed areas with white latex paint. Remove tape when dry. Then tape around the center strip. 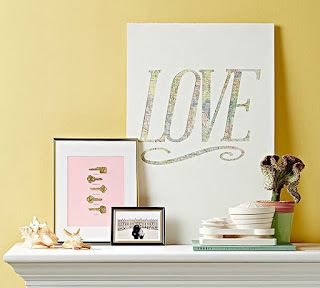 Paint it with decoupage medium, and coat with a thin layer of glitter. Let dry. Use tacks to pin up Valentine's Day cards, quotes, heart decorations, photos, and other remembrances. Instead of casting off old bracelets, earrings, and necklaces, give them new life as a Valentine's Day accent for inexpensive vases. 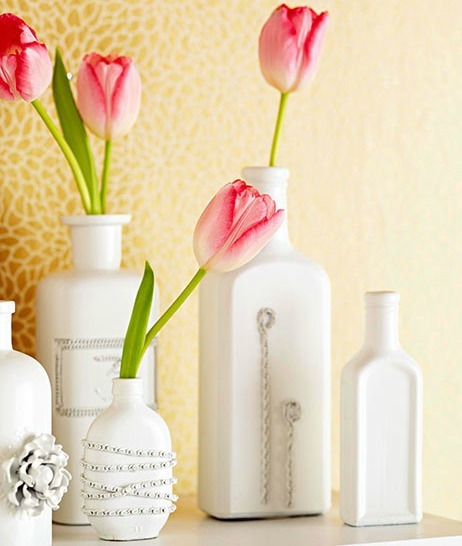 Use jewelry or glass glue to secure chains to glass bottles, either in a neutral color or in pink or red. Try wrapping chains around bottles, outlining shapes, positioning as letters or numbers, or creating other simple designs. We removed the pin from the back of a plastic flower to embellish one of the bottles. When the glue is dry, prime the bottles and paint with high-gloss paint. We chose white, but this collection would look equally stunning in glossy cobalt or yellow. 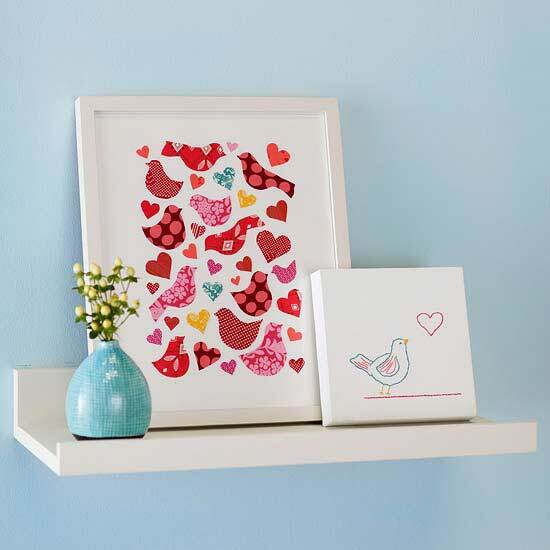 Personalize these cute Valentine's Day crafts for shelves and nooks. To craft the collage, cut out repeating shapes from fabric (we used birds and hearts in various sizes) and use spray adhesive to mount on white cardstock; frame. For more advanced crafters, design a work of Valentine's Day art. Pencil a design on a store-bought canvas, then sew over your drawing using a thick needle (we used a backstitch).